Saving Animals & Healing Hearts accepts donations of goods and services as well as monetary donations. All donations are greatly appreciated! If you would like to donate money to our cause you can use our PayPal donation button above for monetary support or become a sponsor. If you would like to donate material goods, please let us know what you would like to donate and we can make arrangements for pick-up or drop off of the items. 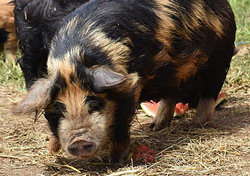 We are always in need of food, blankets, grooming supplies, enclosures, water buckets, and children's plastic wading pools (the pigs love them!). We also accept tack and farm implements as well as tractors and trailers, especially horse trailers. If you are not sure if we can use your donated items, contact us and we can let you know if it is something that will help. Saving Animals & Healing Hearts also accepts and appreciates corporate sponsorships and donations. Corporations offering to help our animals will have their corporate logo posted on our site to show the community your dedication to helping and supporting animals in need. We also have something to donate. If you are needing fertilizer manure, we have a lot of it! Submit the donation form indicating how much you want in the comments and we can let you know when we have as much as you need. We can then arrange a time and day for pick-up.